Westbrook, Maine — February 4, 2014 — DennyMike’s (www.dennymikes.com), the award-winning line of sauces and seasonings, introduced today the brand’s bold new package design along with a generous upsize in the sauces. According to brand creator and company owner Dennis Sherman, the new look and tone of the brand are a more accurate representation of his continued commitment to the highest quality products, and the new pricing structure is a nod to today’s price-conscience consumer. Sherman remains committed to the original recipes, which call for the highest quality ingredients and a small-batch process, and, therefore, the popular products remain wheat-free, all natural and made without High Fructose Corn Syrup. Sherman recently relocated his operation to a 10,000-square-foot dedicated facility to increase production and allow better control over ingredients and the restrictions required for wheat- and nut-free production. In addition to the fresh, contemporary labeling, the 8-ounce sauce flask has been replaced by a more standard 14-ounce round bottle that contains enough sauce for several servings. The 3-ounce rub tins remain the same size but are now in a more user-friendly shaker-style container. Sherman has worked with retailers on a new pricing structure that significantly reduces the cost of the entire product line to consumers. “We listened to what our customers asked for in terms of ease of use and price,” said Sherman. Sherman and his creative team at Portland-based Pulp+Wire strategically enhanced the sophistication of the branding while maintaining brand equity by keeping the color palette for each flavor. According to Taja Dockendorf, president of Pulp+Wire, the package designs have a more modern feel and are simplified to put the emphasis on the individual flavors and sauce styles for deeper shelf impact. Since its successful launch in 2006, the DennyMike’s line has enjoyed rapid placement throughout the Northeast, North Atlantic and Mid-Atlantic regions. The products are currently under consideration by specialty retailers on the West Coast and in the South, and Sherman expects to have agreements in place by the end of Q1 2014. In addition, DennyMike’s has earned more than 60 awards from barbecue experts at the National BBQ Association, the Scovie Awards for Fiery Foods, The National BBQ News and the increasingly popular Getting’ Sauced Competition in Austin, Texas. Sherman has also been embraced by the BBQ community and serves on the board of the National BBQ Association and regularly judges at high-profile competitions such as the Jack Daniel’s World Invitational, Memphis in May and the American Royal in Kansas City. The new packaging will hit store shelves in the first quarter. DennyMike’s is a Maine company with roots founded in the spirit of true, Texas-style dry rub BBQ. All of DennyMike’s award-winning, wheat-free and all-natural sauces and seasonings are hand-crafted in Maine in small batches using only the finest and freshest ingredients available. DennyMike’s seasonings are a great way to begin any food preparation, whether cooking in the kitchen or at the pit, and help create an impressive finish to any meal. Since its successful launch, DennyMike’s has received high praise from high-profile outlets such as the TODAY Show, Real Simple, Saveur and Yankee Magazine. 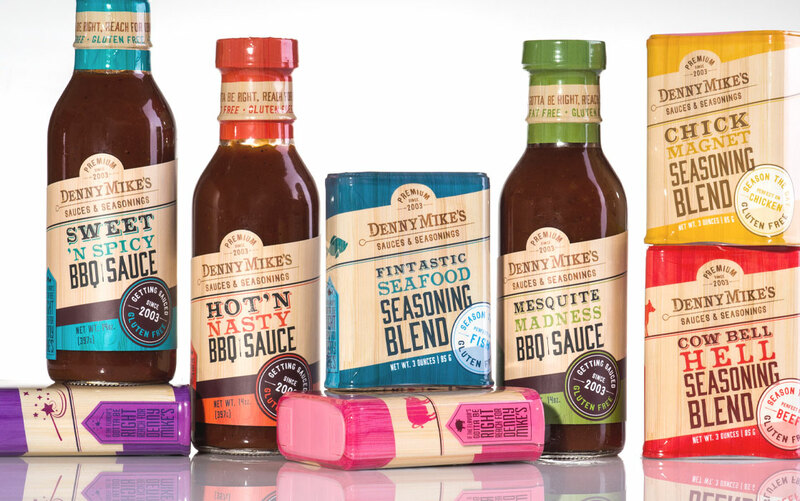 DennyMike’s products are available at an increasing number of specialty food retailers and are available for nationwide shipping at www.dennymikes.com.